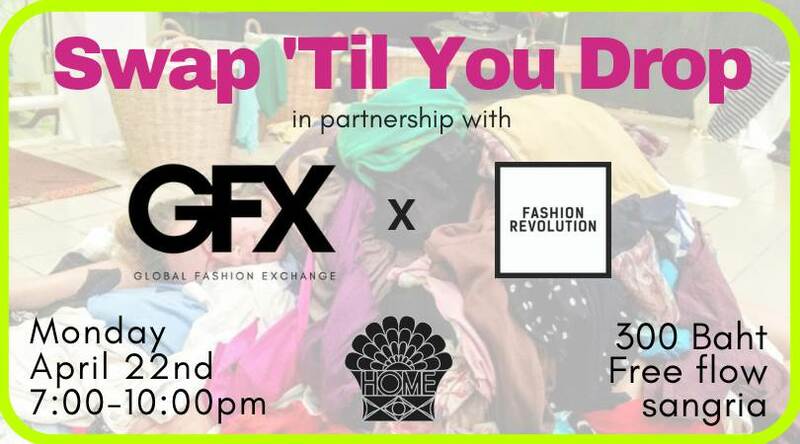 Join us on the 22nd of April, from 7-10pm for the first ever clothes swap hosted by Global Fashion Exchange in partnership with Swap ‘Til You Drop!, at The HOME BKK. We will be swapping in a new way this time around! This will be the kick off event for Fashion Revolution week, which will be loaded with tons of awesome activities all week long around the city along with 2 other swaps in 2 different locations! On April 19 from 2pm - 8pm, we will be accepting drop-offs to screen your items by quality, brand and condition. We will then give your tickets per item via email and you will bring that email to the event to redeem your item tickets to SWAP! Stay tuned in the Facebook events for info about screening your items. Tickets are 300 Baht for this event, and include free-flow Sangria all night!